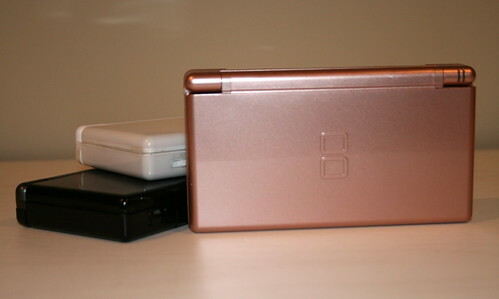 We have three Nintendo dses at our house. The girls each have their own and Kade has kind of inherited Mickey's. Sometimes I think these things are wonderful because it can keep the kids from fighting and entertain them when they're bored. But then the bickering starts. "____ won't let me play _______ game." That's when I want to throw them in the trash and make them play a board game together or send them to their rooms. Today we had a little of both. how do they look so nice and shiny? Jed has one, and its all scuffy. you are so good. And I agree, its a love/hate relationship...We only have one, and the kids actually share for the most part.